The system tray menu shows the currently configured port and offers options to change the settings, view the change history or quit the TUIO server (Quit removed in version 2.00.33). TUIO Server 2.0.33 runs as a launch agent process that will be restarted if it stops or is quit. For this reason the process needs to be stopped using the upddprocess script as described here. 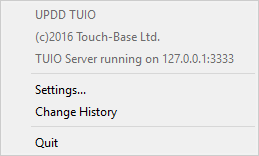 If required you can configure UPDD TUIO to send touches to different ports depending on which touch screen it comes from, in essence running multiple TUIO servers at once, one for each touch screen. This checkbox switches between using the same TUIO host and port for all displays, and using different settings for each display. When checked, it lists each display configured in the driver and gives a field for setting its host and port. If this is not required then you can define the local IP address and post on which to transmit all touch data. Since most usage cases for a TUIO server is to have it running locally on the same computer that the TUIO client programs are running on then a reasonable default configuration is for it to use localhost with the default TUIO IP address (127.0.0.1), port number (3333) and packet size. When unchecked, all UPDD touches are converted directly to TUIO cursors without any changes to the parameterization of their coordinates. So all devices will use a range of 0.0 - 1.0 for the x coordinate of the TUIO cursors, and it will not be possible to distinguish which UPDD device they originated from. If Mouse Emulation is enabled all applications will receive mouse emulation clicks. Applications receiving touches via TUIO interface may not want to also receive mouse emulation clicks and this option is used to specify one or more process names that should not receive mouse emulation clicks. Whenever a process matching one of the names is ‘front most’ mouse emulation will be automatically disabled. Once a window from any defined apps becomes ‘front most’, mouse emulation will automatically turn itself off, regardless of the setting in the system tray menu. Indicates if TUIO server is to be invoked at system start. If TUIO is installed as part of the driver installation this is set automatically. The TUIO server time stamps TUIO frames. By default this is as close as possible to 60 frames per second as per the TUIO specification. This setting can be used to transmit the frames at the same rate they are received from the driver albeit this does not conform to the TUIO specification: 0 or off = 60 FPS, 1 or on = UPDD driver rate. Any application written to retrieve frame times should now receive valid timestamps.